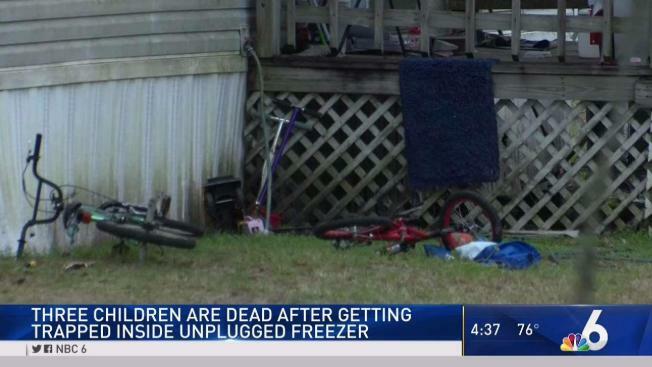 Autopsies showed three young children died of accidental asphyxiation when they became trapped in an unplugged chest-style freezer in their yard in north Florida. Suwannee County Sheriff Sam St. John said there were no signs of trauma on the children, ages 1, 4 and 6. Their bodies were found Sunday at a home outside of Live Oak after they went missing while playing outside. No charges will be filed in the deaths of three Florida children who became trapped in an unplugged chest-style freezer in their yard. In a Facebook post Friday, the Suwannee County Sheriff's Office identified the children as 6-year-old Dawlton Lee Delbridge, 4-year-old Brooklyn Leigh Jackson and 19-month-old Kaliegh Mae Meeks. They died Jan. 13 at the Live Oak home where Brooklyn lived with her mother and Dawlton and Kaliegh lived with their grandmother. In a letter to Sheriff Sam St. John, State Attorney Jeffrey Siegmeister said there was no evidence of foul play, and neither woman tested positive for drugs. He said the freezer had been temporarily stored in the yard until the women could get help moving it inside the home. Autopsies showed the children died of accidental asphyxiation.